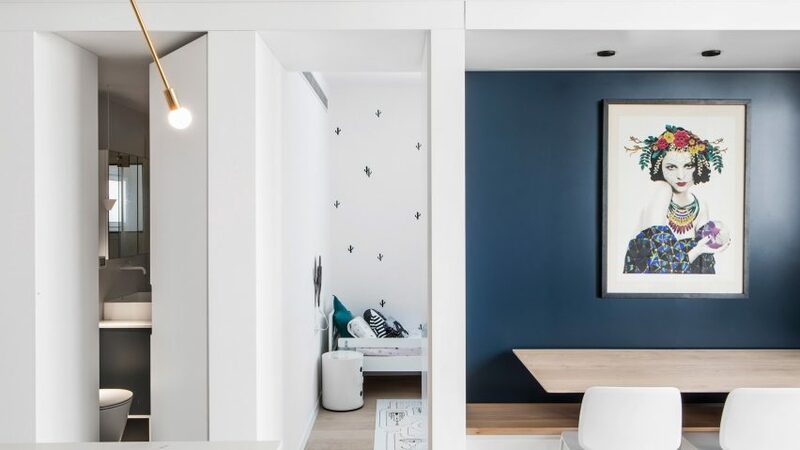 A dining table that partly disappears into a seating nook and storage built into partition walls are among the space-saving solutions employed by interior designer Maayan Zusman at this compact apartment for a family of four in Tel Aviv. The 54-square-metre apartment is located within a building constructed in 1945, which hadn't been renovated since its completion and had consequently become outdated and run down. The owners – a couple with two children – enjoyed its quiet yet central location in the Israeli city, and asked Zusman to develop a proposal to help them achieve the spaces they required for modern family life. The key requirements were a room for each child, in addition to a master bedroom with an ensuite, a separate family bathroom, a practical kitchen with an island worktop, and a dining table. "The first challenge was of course planning a layout that contains all features, incorporating much storage and creating modularity," Zusman told Dezeen. 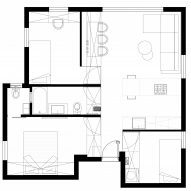 "The floor plan incorporates storage in every centimetre, with cabinets planned instead of walls so as to save space." A three-and-a-half-month renovation process started with ripping out the apartment's existing interior, which only offered two bedrooms, one toilet and an enclosed kitchen. The entirely reconfigured floor plan is divided using dual-sided cabinets featuring floor-to-ceiling storage that allows the family to keep clothes, books, toys and kitchen equipment out of sight. The owners requested privacy and acoustic separation between the rooms, which led Zusman to use solid units rather than transparent glass partitions to segregate the space. The placement of these partitions and their white finish ensures the space remains bright and doesn't feel cramped. The central unit that divides the apartment roughly down the middle integrates hidden cupboards and doors leading to the bedrooms and bathrooms. A dining table positioned in a niche can be pushed back so its base slots away into holes in a built-in bench, creating more space in the main living area. The kitchen provides plenty of storage, including cupboards built into either side of the island unit. Carrara marble worktops provide a textural detail that complements the white cabinet fronts. In the master bedroom, a custom-made bed fits neatly into an opening in the cabinet that extends along one wall. A small en-suite bathroom off the bedroom contains a toilet and a window. The main bathroom squeezes in a toilet, sink unit and compact bathtub, as well as storage built into the partition wall. A small window through to the en-suite of the parents' bathroom allows natural light to enter. The children's rooms are accommodated behind the kitchen and dining area. They both feature custom-made cabinets and are decorated to match the rest of the house. Throughout the interior, the majority of surfaces are white to maintain a light and clean aesthetic. Navy accents combine with wood surfaces and brass details to introduce warmth and texture to the spaces. Rotting wooden windows were replaced with graphite-black aluminium frames that contrast with the white walls. A brass pendant by Lambert & Fils provides a bold feature above the kitchen, while the rest of the lighting is unobtrusively integrated into the ceilings and walls.